Below is one of her acrylic ink artworks. DARIEN — During the day, you can find Westport resident Linda McKie McClellan working as a licensed optician at Norwalk Eye Care. But in the middle of the night, when she can’t sleep, you can find her in her dining room turned studio, working on her art. McClellan finds time for her art in little moments, like when she can’t sleep at night or when she sees something inspiring in her Westport neighborhood by the Saugatuck. When she isn’t working on her nature-inspired pieces from her 30-foot deck, she’s searching for inspiration in Solomon Park, Compo Beach or Burying Hill Beach. 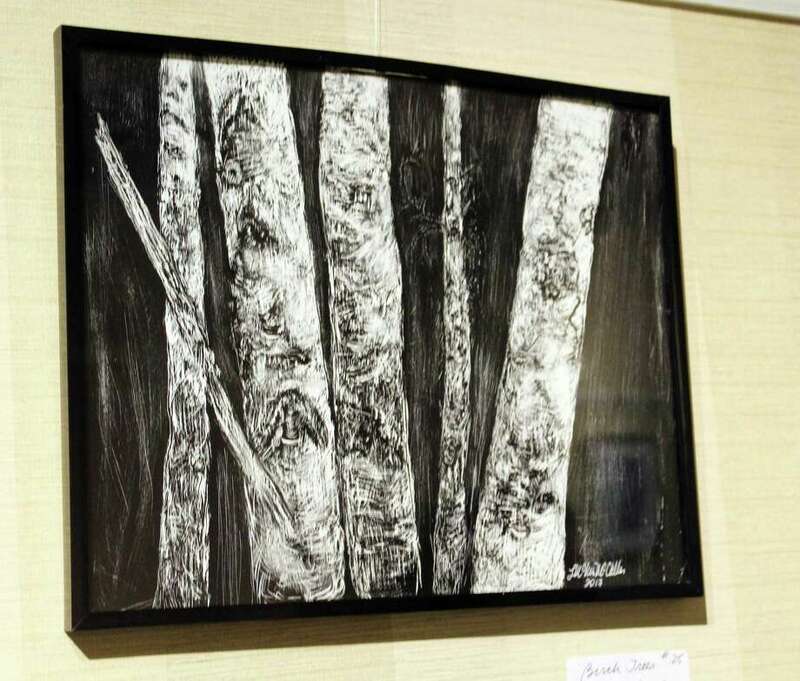 McClellan’s hard work has paid off in the form of her fifth exhibit as the featured artist at Atria Darien. A longtime Fairfield County resident who’s also lived in New Canaan and Norwalk, McClellan has exhibited her work around the state, as well as in New York, Pennsylvania and Florida. She’s taken advantage of the thriving art scene in the area to make connections, such as the one that eventually led her to Atria Darien. The 67-year-old is a member of the Fairfield County Artist Collective which connects her to different shows in the area. However, she found out about Atria through a client at Norwalk Eye Care and originally showed her work at the Atria in Hamden. McClellan’s latest Atria exhibit is inspired by flowers from her own backyard (she counts gardening as another one of her passions). The self-taught artist works in a variety of media, including paint, drawing and collages. Her latest collection of new pieces at the Darien senior living facility is done in acrylic ink. While McClellan describes herself as mostly self-taught, she did attend classes at the Wooster Art Center in Danbury and at the Westport Center for Senior Activities and studied art at Temple University for a year, despite her childhood ambitions to become an oceanographer. Through these classes, she’s dabbled in a variety of media including sculpting and photography. She often photographs the land and seascapes she later depicts in her work, including a series of recent seaweed photos that will be her next series. She cites watercolorist Charles Birchfield, Georgia O’Keefe, Jackson Pollack, Salvador Dali and painter Wolf Kahn as her influences, inspiring her with their use of color and design. While McClellan finds most of her time is spent at her day job, she said she always makes effort to put time into her art and hopes to work on it fulltime upon her retirement. A believer in having art in the home and a lover of explaining the artistic process, she also would like to teach.